f it seems like there hasn’t been a lot of news lately coming from the algae industry’s largest algae-to-fuel gamble, Sapphire Energy, well, we’re happy to report that it’s not about trouble in paradise. It’s more just a lot of work being done on the inside and a lot of development work on the outside—a hundred acres worth. As for the silence, “It’s kind of like the swan swimming on the surface, looking very graceful, but with the feet going crazy under the surface. We’ve been busy scaling up!” says company President and Chairman Cynthia (C.J.) 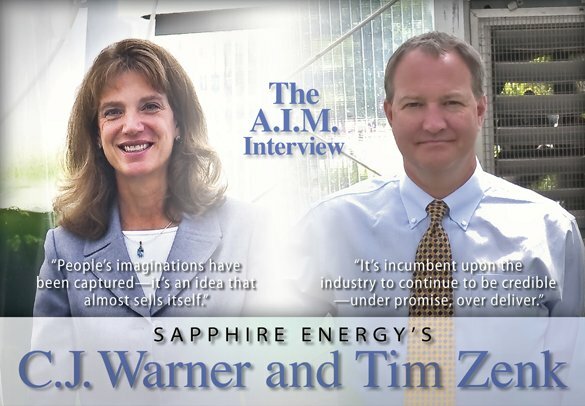 Warner, a chemical engineer who prior to joining Sapphire served as Group Vice President, Global Refining for BP, where she was instrumental in turning around BP’s US refining business. C.J. 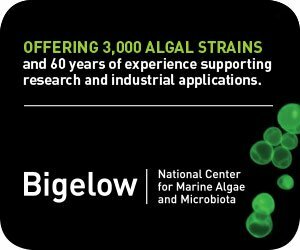 keynoted at the recent Algal Biomass Summit, attending along with Tim Zenk, Sapphire’s Vice President of Corporate Affairs, who was formerly executive vice president for the Edelman communications firm, doing international work on behalf of the Clinton/Gore administration. 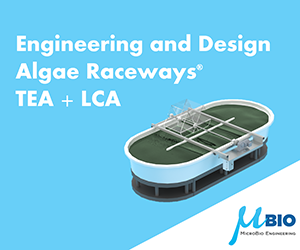 The two made some time to give us an update on their progress at Sapphire Energy, truly a bellwether for the biofuel sector of the algae industry. Has the strategy at Sapphire changed over the past couple of years? C.J. : No. Actually we’re living the dream. We’re on track with the strategy and it’s starting to come to life before our eyes, which makes it very exciting. It just takes a lot of effort. And so our decision was to stay internally focused and deliver on what we said we were going to do, as opposed to making a lot of noise about it. Tim: That’s always been Sapphire’s way. We try to under promise and over deliver. When we say something, it’s serious. So you’re not going to see us out there pounding our chest. It’s just not necessary. So many of the early stage companies over this past year or two have gone through a change in strategy, seeing that fuel is more for down the road, and higher value products should come sooner. Has your strategy been affected by that kind of thinking, or are you still pursuing the original target? C.J. : We are determined to make that step to get to fuel, and the scalability is so inherent to what we are trying to do. The model of truly being able to change the world for the better—you’ve got to achieve scale in order to do that. So we’re definitely on track with that. I would say, though, that we are not blind to the advice that financiers might give to try and find higher revenue streams earlier on. There’s nothing wrong with that—it’s actually a good philosophy. But if you don’t keep your business model focused on where you’re trying to go, you aim off with your innovation. So, we’re staying focused on the long term, and aiming high with our innovation and our technology, and then, in the short term when we actually start producing, we’ll be able to make those high margin products as well. But we’re not going to stop there. That’s just going to help us in the short term. Much of the work at Sapphire has been focused on crop protection. 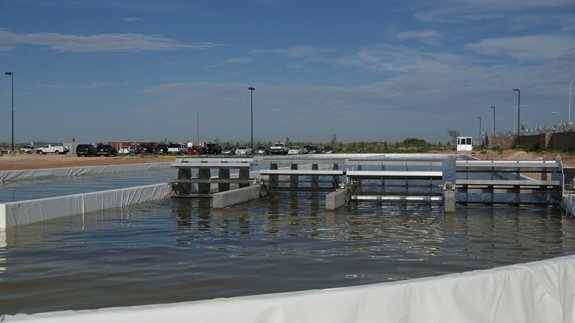 With the prospect of building hundreds, and eventually millions of acres of open ponds, how are you dealing with contamination issues? Have you worked that out? C.J. : Well, it’s perfectly analogous to any other form of agriculture. The pests are out there, the weeds are out there, and they’re going to come. So you might as well attract them early on, figure out how to deal with them, and then just move ahead knowing that they’re there. So that’s exactly what we’ve been doing in Las Cruces with those open ponds. We’re learning how to deal with those pests. We have focused on crop protection, and we have various mechanisms for dealing with it, both from a strain selection standpoint—taking strains that are already able to cope with it, or that can be given traits that make it easier to cope with. And then we also have cultivation techniques that enable us to protect our crops. You’re also dealing with a wide variety of climatic conditions, especially the drought. Has that affected anything? C.J. : No, again, the climatic conditions are part of the game, so it’s better for us to get a wide variety of things earlier on so we learn how to deal with all of them. For example, we joked that this last winter was the coldest winter on record in Las Cruces that anyone could remember. It was extremely cold. It was not pleasant for the employees, but it was a real blessing because it gave us an opportunity to study something that might have taken us a long time to get to. But we got it early on when we were at small scale, as opposed to learning about it at large scale. You also got a hurricane to deal with last year, along with the annual monsoons. So, can you manage a monoculture through the kind of weather patterns we get in New Mexico? C.J. : Yeah, you can. You learn to anticipate it and understand it. We do a lot of testing and forecasting to see when something might be going awry, and then respond to it early enough so we can recover from it. We’ve been doing a lot of that and, actually, we are experimenting with multi-cultures. In some cases it’s naturally occurring, so a weed will show up and as long as our strain grows faster than the weed, it really doesn’t matter. We’re learning how to cope with those things. What’s your harvest cycle going to be like when you’re fully deployed at the ponds? C.J. : The growth rate changes with the seasons, so harvest rate changes a little bit, too. On average, once everything comes up to a constant rate of growth, we bring about a third of the pond down every day. In the coolest part of the winter that will slow down, and in the hottest part of the summer it will speed up. You said this morning that you’ll be in full development at the Columbus, New Mexico, facility next summer. C.J. : Next summer we’ll start Phase One of the commercial demonstration system. We’ll start to demonstrate the full integrated process and then we’ll keep growing it all the way through to 2015. The alliances that you have announced over the past year—Monsanto, Linde—what are they bringing to the party? C.J. : It’s fantastic. They’re both very specific partnerships in terms of what we’re doing together. With Monsanto, it’s all about collaborating with developing strains and traits, and identifying genes that really make a difference, to get the traits into the strains. Monsanto gains because anything we learn can be applied to terrestrial plants, and we gain by applying their knowledge to our aquatic plants. There are people who have, shall we say, less than praise for Monsanto. What is your experience with them and your opinion of how they operate? C.J. 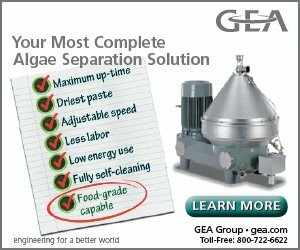 : They are the most sophisticated bio-ag company out there, and the most successful. And we’re in bio-ag. So, if there were anybody we could learn from, it would be Monsanto. And they do so much good for the world, if you think about it. They’ve increased corn yield, for example, four percent year on year for decades. They are feeding the world’s population. They’re pretty amazing with what they’ve been able to do. Tim: And I think you just need to separate the rhetoric from the reality. The reality is that since Monsanto changed their business strategy into a bio-agricultural company they’ve done a lot of good. They have a past that was a different company, when they were in the chemicals business. I think that reputation is a hangover from those years gone by. But the truth is that they’ve done a really good job of working on their reputation and producing products that are valuable. If you look at all the cotton grown in this country, it’s probably been assisted through a gene or two that Monsanto has improved upon in that plant. There isn’t any cotton grown in the United States pretty much that doesn’t have that BT gene in it—same with many of the new energy crops that are being created. Their corn has higher amounts of sucrose and different chemical compounds within it that make it easier for the ethanol industry to use in their processing. It’s improved that business, and the same will be true in ours, as well. They’re collaborative and, scientifically, they are one of the most credible companies. There isn’t anyone out there that is more credible in biotechnology and energy. So for us they are a fantastic partner and, most of all, what it does for Sapphire is that it validates what we are known for, our biology and our expertise around that business. It also validates our model, which is that this is going to be agriculture. So all of those things combined roll into them being a good and very strong partner for us. C.J. : They are our partner in CO2 supply and delivery and, of course, gas supply and delivery is their core competency. We depend on it as our feedstock, but it’s not our core business, so it’s a perfect partnership because we both will benefit from the other being successful in what we are doing together. How does that play out practically? Is it something that ties into co-location with CO2 generating facilities, or is it more around packaged CO2 delivery? C.J. : The first major traunch of it is going to be more co-location than anything, so you look for a point source, you concentrate it, and you deliver it. You can do less concentration if you’re closer. If you are further from the source you do more concentration and longer delivery. There is kind of an optimum point that you can choose, depending on your source and where you need to deliver. And Linde’s helping us make those kinds of choices, which will help us in making early decisions for our first commercial plant. Having said that, there are a lot of interesting second and third generation options, which allow you to locate much further away from point sources. You’ve said that waste CO2 will become it’s own valuable industry. Would you explain that a little more? C.J. : Currently CO2 is a waste stream. As soon as we start realizing it is a source of carbon, which is useful, and we can fix it into fuels and start making valuable products out of it, we’ll realize that what was yesterday’s waste is today’s feedstock. Once we’ve done that we can start creating a paradigm shift, and that shift will bring innovation to it, and we will build a whole industry around recycling carbon – which is exactly what we want to do. We create a big cycle, and that’s sustainability.